Meeting in Tallahassee this morning, the Florida Ethics Commission voted 6-1 to find probable cause that Flagler County Sheriff Jim Manfre violated the state’s ethics laws on three counts. The three counts relate to issues early in Manfre’s tenure: several trips out of state in Sheriff’s Office vehicles, accepting and not reporting a gift of more than $100 in value, when he stayed at a time-share type of accommodation in Tennessee owned by then-Undersheriff Rick Staly, and Manfre’s use of a Sheriff’s Office credit card for personal purchases. The commission advocate had recommended finding probable cause on all three counts (no probable cause was found on a fourth count). Today’s action by the commission ratifies that decision. Manfre doubled down: he disputes all charges, has rethought the wisdom of having at one point agreed to a settlement that would have reduced the charges to just one, and now intends to fight the charges all the way to a court of appeal if necessary, saying he violated no laws, no rules and no procedures. Though he apologized three times, the apology was not about his conduct, but about “this process,” and the distraction it was causing–an apology that in essence amounts to a different form of blame for whoever triggered the process in the first place. Android and iPhone users, click here. Manfre said the issues took place early in his tenure, following which he directed his staff to prevent the issues from occurring in the future. “Had best practices been in place at the time I took office, none of this would have happened,” he said, opening a line of reasoning that would again and again shift what blame there is for the missteps, or perceived missteps, on his staff or the office’s previous occupant: the former sheriff, Manfre’s finance director, his undersheriff, his director of policies and procedures, all of whom are no longer at the office. One was arrested soon after Manfre took office (the director of policies and procedures). One filed the ethics charge and a federal lawsuit against him (Linda Bolante, the finance director). And one is likely to run for sheriff against him (ex-Undersheriff Rick Staly). Ex-sheriff Fleming has already announced that he is running. “These were practices,” he said, placing the responsibility on the previous administration for “not having proper, written procedures in that I could have then looked at and then acted on.” Fleming said he wasn’t ready to comment today, but noted that what procedures were in place in his tenure had been inherited from Manfre’s before him–in other words, that Manfre was acting on his own first tenure’s procedures. For all his defiance–and his sense of assurance that he will be vindicated–the issue makes Manfre’s efforts to win another term in 2016 more difficult. He had campaigned in 2012 primarily on an ethics platform, organized and attended two mandatory ethics training sessions for all agency personnel, and launched an acronym to define his tenure at the agency: AIR, which stands for Accountability, Integrity and Respect. The acronym appears on many sheriff’s documents, including the daily commanders’ reports. 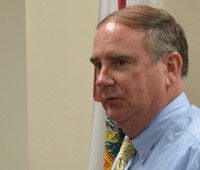 The sheriff’s drive for ethics was inspired by his predecessor’s issues with the ethics commission, as Fleming, too, had been the subject of an ethics investigation that resulted in a $500 fine, though that matter, involving just one count, was less serious than the charges Manfre now faces. Audio: Manfre’s Full News Conference [sc_embed_player_template1 fileurl=”https://flaglerlive.com//wp-content/audiovideo/Manfre-news-conference.mp3″]Android and iPhone users, click here. There will be no jury trial in the ethics matter at hand. “The next step is to determine whether or not a violation of law has occurred,” Kerrie Stillman, the commission’s spokesperson, said in an email. “The Sheriff can choose to enter into a settlement agreement with the Commission Advocate that would then be considered by the Commission at a later date; or, he can request a public (full evidentiary) hearing before an Administrative Law Judge (ALJ) at the Division of Administrative Hearings (DOAH) where the ALJ’s Recommended Order will be considered by the Commission at a later date. The commission advocate last year had recommended a settlement, eliminating two of the three charges, and recommending a fine of $1,500 against Manfre. Manfre himself agreed to that settlement even as he disputed its merits. But when the recommendation went before the full ethics commission last December, commissioners were displeased with the settlement, finding it improper, if in fact the violations, including the dismissed violations, had taken place. The commission asked for a renewed and more detailed investigation. The result of that investigation led to the original conclusion: that Manfre appeared to have violated ethics laws on three counts. The advocate this time submitted a recommendation of three violations, without settlement. Today, one commissioner argued that it wasn’t the place of the commission to second-guess Flagler County’s voters. Other commissioners countered that the commission was not delving into Manfre’s future, but addressing only matters relating to ethics issues. Manfre today maintained, even regarding the credit card use, that in every case, he was on official business, and he was following what he thought were procedures in place at the time. He said his finance chief at the time, Linda Bolante, had never told him that what he was doing was irregular. Manfre was saying that ignorance of the law is a defense–a claim the investigative report, the commission’s conclusions and a history of innumerable fines and penalties levied for ethics-law violations all dispute. One of the charges relate to Manfre’s alleged failure to file a gift report after staying at a cabin owned by Staly. Manfre says it isn’t true that Staly had cautioned him against using the cabin without considering it a gift that must be handled in accordance with ethics rules. Manfre says he and Staly found out that it was such a gift at an ethics training session, following which he filed a gift report that showed he stayed for three days for just under $100. The actual cost of the venue was larger than that, running higher than $100 a day. “The value of it is something I do disagree with the commission about,” Manfre said. The attorney costs for the case so far have been underwritten by the sheriff’s office larger insurance policy. But from this point forward, Jim Troiano, the sheriff’s spokesman said, all legal costs will be assumed by Manfre personally. You do not deserve to wear that uniform. Ethics and Manfre………They just don’t sound right together !!! That’s an interesting statement. Is this commissioner arguing that somehow elected officials are free from consequences that extend beyond simple fines? If that’s the case, no wonder Florida’s legislature is filled with the trash that it is. was always depicted with his hand in his waistcoat. Check and see if the honorable sheriff does that too. You were kind of OK in retrospect. Better. Betterer. He’s on the wrong side of the law.. He should be in the old Jail and then when the new one is finished he’ll be much more comfortable..
Why do people in authority, and who should know better, do these things? Do they think no one is looking? Do they think no one cares? Are they supremely arrogant or just dumb? Someone please find us a sheriff who follows the laws he/she is elected to enforce. Staly is the right guy for that. Obviously Manfre is bitter towards Staly, because Staly towed the line, explained it to Manfre, urged him to make the proper report corrections, and when he didn’t and Bolante (the finance Director) filed the complaint, Staly told the truth and basically became the star witness, along with Bolante, who Manfre fired over all of this. So, Staly, a 40 plus year veteran Florida police administrator and undersheriff in 2 counties with a flawless record, an FBI and SPI grad, should be our next sheriff. Enough with amateur hour and dishonest politicians. It’s time we have a professional Sheriff. That’s what all the FCSO employees are praying for. Now hopefully the citizens of our good a County will too! I respect your support for your friend but I can’t help but wonder why he didn’t take a stand while still employed at the Sheriffs Office. I don’t know what the “FCSO employees are praying for” but I’d assume what they’re hoping for is to have a person in office that actually has their backs and will stand up for what is right. A good conscience forces a good person to do that…even if it means defying a boss’s unethical, immoral decisions/orders. John Pollinger who was a dedicated retired police Chief from Middletown N.J. was more then qualified. I have known John for over 30 years and nobody is more dedicated and honest. But no, he did not get the votes. Stevens knew he’d never get elected so he went after Pollinger. The people of Flagler knew Manfre was a dirt bag, yet they re-elected him. Go Figure. We have a President who will not enforce the laws he sworn to uphold why should a sheriff be any different. Dunno about that, I took a look at the oath of office and I don’t see anything regarding these supposed laws you claim he isn’t upholding. Hopefully the Gov. removes him from office. We cant have this in charge of our local law enforcement. I hope everyone remembers this during the next election. The governor would have to remove himself first. Florida is in the top-ten of corruption-ridden states. become governor of this humid, and swampy state. some more, and work HARDER at violating public trust. Only then can he be your next governor! Disputes the findings and blames others. Seems that is the definition of taking responsibility for one’s own actions is these days. I’m glad the Ethics Commission didn’t buy it. Please resign the position Jim. How’d that nepotism work out for you? Too bad Florida’s statute only covers relatives, because that would be another ethics violation right there. He should have known. Use of a Sheriff’s Office credit card for personal purchases is totally unforgivable. The use of the official vehicles is as bad. I am always surprised by this local stuff. The Capela thing was horrendous. Don’t they give these public employees basic orientation? Next up? The city and that mess over at Palm Harbor Golf Club; thousands in the red again this year, $1.5 million more being poured into it and renewing that contract with Kemper. Why it’s almost as bad as paving the wrong road! Finally some justice! Long over due but the wheels do turn slow and this time in the right direction..
Manfre, Staly and Fleming are Flagler’s version of the three stooges. You’re not going to like me Buddy because I’m going to catch these sway intentioned unsubstantiated blanket statements. How do you know what/who an entire department wants? Based on comments you have made on this site, you are a self appointed speaker of Sheriffs Office employees possibly hoping that the reader believes you really do have some insight.. How is it that you feel you can speak for them? Note..My comment here is in no way a slam on any candidate or anyone’s support of candidate. I just take issue with how some get so wrapped up in that support that unproven claims are made which can actually hurt a candidate more than help. Okay Ray, you ask any of the employees. Any who were here for the messes created by Manfre, the. Fleming, and then Manfre again. Their hope has faded. Morale is non-existent. We are losing qualified individuals each and every day to smaller agencies and surrounding counties because of the lack of leadership. Then ask them of those potentially running, whom they want to see become sheriff. Although I may not speak for all of them, and can’t proclaim myself a spokesperson, I know you will find that most, if not all, believe Staly would be their choice for Sheriff, if they could influence or have some say. I speak to FCSO employees regularly and almost daily, at various levels, road, jail, admin, etc. and the great majority have expressed their concern for and need for leadership and the great majority have expressed their hope that Rick Staly would run for and become their next sheriff, in order to restore hope, ethics, and dignity to the agency. That’s all I’m saying and the facts of the case clearly speak for themselves Sir. No offense taken. I appreciate your question and hope you will research my statements. Should you choose to do so, you will find exactly what I’ve just stated actually is the case. Thanks. God Bless you Ray. Are you speaking for all the deputies here? Certainly not and not officially. But have spoken to soooo many who actually have told me that and have hope it will happen and Staly will run. I hope so too! Buddy, you say Staly warned Manfre three times to take corrective actions. Manfre didn’t do so, and Staly as the #2 in the agency just sat there and watched. Why didn’t he file the ethics complaint? He knows how to do such a thing. Remember he filed against the Orange County Sheriff, which appears that it was just an election ploy as FDLE found no merit. Yes, Staly retired, but in my eyes certainly not honorably. How can you call it honorable when he ignored Manfre’s violations, leaving the department in financial problems(they currently have serious money issues), they are on the verge of losing their accreditation (buddy, the accreditation process is a continuos issue that under his command has failed to meet. As a Staly fan you can’t argue his failures on this important issue as an agency doesn’t get this close to failure in just months! ), the extremely high turnover rate has continued under his command (true leaders lead by example showing others the benefits of hard work and loyalty). You sound like Staly’s campaign manager, but wait, Staly said he was retiring to spend time with his family. He also said he would never run against Manfre. So if he runs doesn’t that make his nose grow? Staly is well educated, but then again so is Obama and where has that gotten us? It is time for someone new, 16 years of Manfre and Fleming are enough! Staly would be just like them. We need somebody new, with fresh ideas and forward thinking with the ability to lead and manage us into the future and not the past. You can ridicule him all you want (rightly so) but you do have to acknowledge that the reason why things like this get “discovered” after someone quits or is fired is because the vast majority of the officers out there turn a blind eye to the behavior of their peers. It happens in other professions as well, but the fact that it’s so endemic in a profession that’s responsible for enforcing the law is inexcusable. Our little Peyton Place of petty political paybacks. The beat goes on in little Flagler County. Larry jones for sheriff, a real stand out guy, years of experience, he is the one to bring integrity back to the sheriff department. It’s like the cartoon in the paper, not me… and he is a lawyer, come on now… only when it’s to his benefit… some lawyer doesn’t seem to know much .. We need Fleming back – voters are now paying for it. It’s NOT MY FAULT….It was “them”…..They are to blame! Manfre, no wonder you had so much trouble qualifying with your gun; you have pointed your fingers so often at other people, you’ve worn yours down to the knuckle. Great now the Sheriff’s Office is going to get sued by Budweiser for ripping off their commercial. They already did this same press conference 8 years ago. OMG that is hilarious, I totally forgot about that. Please City of Palm Coast, start our own Police Department, and recruit nationally for a chief. Enough of the County Elections, look what we have suffered through. We have a large fire department and no police force, we pretend to be a real city don’t we? Please help us, citizens of Palm Coast. Who si paying for the legal costs for him to fight this? We had a chance to elect John Pollinger but the RRR went after him because he wasn’t Republican enough for them. Remember Ms. Shaeffer”s lawsuit. Blame them for getting us Manfre. They used their smear tactics to prevent a good man from getting elected. Citizens of Flagler County WAKE UP!!! YOU have the power to change this unethical fiasco of authority!! Stop burying your heads in the sand and DO SOMETHING in the election!!!! Fleming was a good man, John Pollinger is an excellent leader with plenty of experience, and above all he’s HONEST! Please voters DO SOMETHING RIGHT!!! Get rid of the rotten apple in the barrel before is rots any more!!! Fleming, the former sheriff who was also found guilty of ethics violations?? Lol. NO THANKS!!! 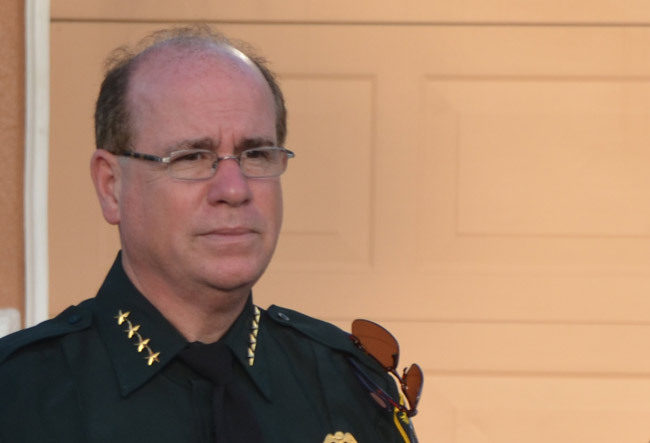 Something that I think is being overlooked here is that this isn’t Manfre’s first run at being sheriff here in flagler. City of Palm Coast and become a politician or policeman, just like in your Dreams !!! I am simply dumbfounded at the thought a veteran attorney would use the excuse “he/she old me to do it” – more or less. A professional of any practice should know better to put it politely. The state should also look at removing him from the ability to practice law..
Just listened to the audio from the hearing! Wow that paints a much clearer picture. Unbelievable!!! Well to be honest when you politicize an office don’t be surprised if a politician fills the position. I’ve personally never understood why positions like sheriff are elected ones; really, they should be appointed by the board of county commissioners so at least there’s some level of accountability and the ability to get rid of a problem without some sort of recall proceeding. I know the county commissioners are a collection of questionable actions but at least the public could openly nail them during a meeting for some type of action. As it stands now you have this clown in an elected position whose character and ethics are questionable at best and the public really doesn’t have a recourse in the matter. I suppose someone could circulate a petition to get an action for recall, but that requires verifiable signatures and names – can you imagine the potential for abuse there, considering the drama regarding payback that circulated all of the firings once he got back into office? I strongly disagree with you about the Board of County Commissioners appointing our Sheriff. First of all the law does not allow them to do so, and with good reason. We have 5 county commissioners and a county attorney who all are under ethics investigations, and at least 4 of them already paying a financial penalty to the Ethics or Elections Commission. I wouldn’t trust these county commissioners to walk my dog let alone pick our Sheriff. It is the voter’s right and responsibility to pick their elected officials. I supposed you are the one that was a strong endorser of Charter Government in recent years…Hmmm. To get rid of the problems here in this county those that are elected (and their staff) need to be held accountable and hopefully the Ethics Commission and Florida BAR will do just that. With Florida being recognized at the most corrupt state in the nation, it is obvious the state is full of those like the Sheriff and these County Commissioners–those who believe they can do as they want and think they are above the law. They apparently forget they take an oath to office and work for us the tax payers. I hope FL will post a copy of the complaint that was filed against Manfre. I am sure there are details in there that haven’t come out that would be interesting to know. Why is the Sheriff speaking before the press in a suit rather than his law enforcement uniform that he struts around in? It’s a technique lawyers use for those they defend… It’s why they make criminals get haircuts, shave and put them in suits for trial….clean them up so there’s no preconceived bias based on appearance…he did the same thing..the uniform is authoritative…how could he proclaim not to know policy and or laws while wearing the uniform of the top law enforcement person in the county? He softened himself up. I wonder – has anyone ever told Flagler County voters the definition of insanity? “It’s just fines….that’s all it is” Is it or isn’t it Mr. Manfre? Because in a past Flaglerlive article about Fleming when he was fined over a membership card that had no real monetary value and he actually paid for what he ate there and DID NOT use the company credit card to do so, you said ….. So again, is it just fines or is it what you said here? And since the ethics findings on you are far more egregious, what do you think about your standing in the community and in the Sheriffs Office? Not only broken but beyond repair I’d guess.